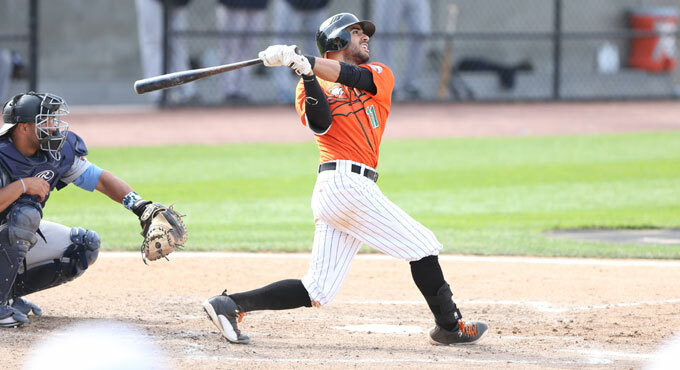 (Central Islip, N.Y., July 16, 2015) – The three-time Atlantic League champion Long Island Ducks today announced that infielder Reegie Corona has been signed by the Washington Nationals organization. He will report to the team’s Double-A affiliate in Harrisburg, Pennsylvania and is the Ducks’ ninth player signed by a Major League Baseball or foreign organization this season (Bobby Blevins, Taiwan; Kevin Vance, Diamondbacks; Trayvon Robinson, Diamondbacks; Mike Blanke, Red Sox; Hector Ambriz, Nationals; Mickey Jannis, Mets; Andrew Barbosa, Braves; Lew Ford, Mexico). He also becomes the 78th Ducks player signed by MLB all-time. Corona departs the Ducks with the second-best batting average in the Atlantic League at .331. In addition, he ranks second in the league in runs (45) and triples (5), third in on-base percentage (.386), fourth in hits (85) and total bases (117) and fifth in slugging percentage (.455). In 65 games, the 28-year-old also totaled three home runs, 31 RBI and 13 doubles and 11 stolen bases in 13 attempts. Defensively, he compiled a .982 fielding percentage. The Venezuela native spent the first eight seasons of his career in the New York Yankees organization, reaching as high as Triple-A three separate times (2009, 2010 and 2013). In that span, he was selected to play in three All-Star Games (2006, South Atlantic League; 2007, Florida State League; 2009, Eastern League). Corona was originally signed by the Yankees as a free agent in 2003.